A Royal Charm The Kingston Vinyl Arbor is handsome and grand. Use it at a centerpiece for a garden entrance or to adorn a ranch or large front yard. The lattice work gives the Kingston an air of confidence and superiority. Unlike arbors made of wood, our vinyl garden Arbors won’t rot. They don’t need an annual paint job or weather treatment. And since our arbors are made from high quality vinyl, they won’t warp, fade, or rust. Best of all, they are maintenance free! The Kingston Arbor is made with a very high commitment to quality. It is blow-molded with 100% vinyl for strength and maximum resistance to fading. The arbor post walls are .120” thick, rails are .110” thick, and spindles are .080” thick. The posts are 4” x 4”. The arbor is held into place with aluminum ground anchors, which are included with the arbor. The craftsmanship is outstanding, right down to the finest detail. 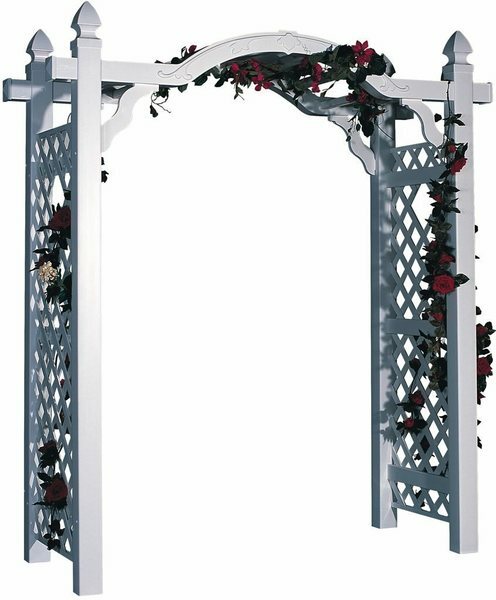 This garden arbor can be assembled to a width of either 50" or 66", depending on your preference. It comes with an optional garden bench. DutchCrafters Arbors come with a manufacturer’s lifetime warranty, which demonstrates pride and confidence in our products.